Exopolysaccharides (EPSs) produced by lactic acid bacteria are important for the texture of fermented foods and have received a great deal of interest recently. However, the low production levels of EPSs in combination with the complex media used for growth of the bacteria have caused problems in the accurate analysis of the EPS. The purpose of this study was to find a growth medium for physiological studies of the lactic acid bacterium Streptococcus thermophilus, and to develop a simple method for qualitative and quantitative analysis of EPSs produced in this medium. A semi-defined polysaccharide medium was developed and evaluated on six strains of Streptococcus thermophilus. The EPSs were analysed using a novel protocol incorporating ultracentrifugation for the removal of interfering sugars, hydrolysis and analysis of the monomer composition by High Performance Anion-Exchange Chromatography with pulsed amperometric detection. The medium and analysis method allowed accurate quantification and monomer analysis of 0.5 ml samples of EPSs from tube cultures. The presented medium should be useful for physiological studies of S. thermophilus, and, in combination with the method of analysis of EPS, will allow downscaling of physiological studies and screening for EPSs. The texture of fermented milk products is often dependent on the exopolysaccharides (EPSs) produced by lactic acid bacteria. The biosynthesis of EPSs has been extensively studied in recent years, and the amount of EPSs produced and their composition have been the focus of a number of studies [for a review see ]. However, many of the studies have been limited by the fact that complex growth media often contain polysaccharides, and that the methods used for quantification of EPSs require large sample volumes while still having considerable standard deviations. Defined or semi-defined media for the production of EPSs have been described for Lacotococcus lactis[2, 3] and Lactobacillus bulgaricus[4, 5]. However, to our knowledge, no such medium has been described for the industrially important Streptococcus thermophilus, which is widely used for yoghurt and mozzarella production. Traditional methods for purification of EPSs involve removal of the cells by centrifugation, and protein removal by trichloracetic acid (TCA) precipitation or protease digestion . The polysaccharides are then precipitated with ethanol or acetone, and purified by repeated washing and precipitation or dialysis to remove sugars that interfere with the analysis. The EPSs are normally quantified as total sugars using phenol-sulphuric acid  or anthrone , by weight or by refractive index detection after gel-permeation chromatography . The isolation is laborious and, in addition, some polysaccharides may be difficult to dissolve once precipitated. Furthermore, large sample volumes are required for accurate quantification. Here we describe a semi-defined medium, which does not contain any background polysaccharides, and in which different strains of Streptococcus thermophilus grow rapidly and produce EPSs. Furthermore, a new small-scale analysis method, which enables simultaneous quantification and monomer analysis of low concentrations of EPS is described. A medium was developed with the aim of being easily prepared and polysaccharide-free, that would resemble milk and allow the rapid growth of S. thermophilus and high levels of EPS production. The medium, called MST, is based on the SD3 medium, originally developed for L. lactis. The medium, which contains lactose, buffer, vitamins, trace elements and casamino acids, was supplemented with various amino acids in proportions that correspond to those of milk casein. The medium was tested using S. thermophilus LY03 and the omission of single medium components in order to simplify the medium. Components that had no effect on the maximum specific growth rate or maximum optical density were excluded. The final composition of MST is given in Table 1. We observed that the addition of proline actually decreased the maximum specific growth rate of S. thermophilus. Interestingly, S. thermophilus was recently reported to be unable to liberate monomeric proline . * The values have not been corrected for the composition of casamino acids, but only represents the amounts added of the individual ingredients. A protocol for EPS isolation using ultracentrifugation was developed. After the removal of cells and proteins by centrifugation and precipitation with TCA, the polysaccharides in the supernatant were separated from the medium components by ultracentrifugation. This purification method does not involve precipitation of the EPSs, and thereby does not suffer from problems associated with redissolving the polysaccharides. The concentration of EPSs after purification is in the same range as in the cultures, i.e. less than one g/l. 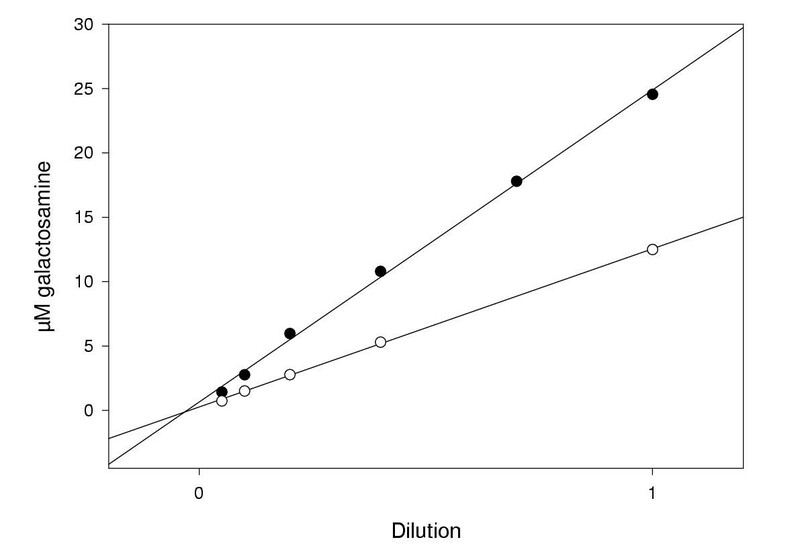 For quantification of the EPS from highly productive strains, the anthrone method  could be used, as it is accurate at concentrations higher than 10 mg/l. However, we preferred to quantify the EPSs as monosaccharides after hydrolysis by High Performance Anion-Exchange Chromatography (HPAEC) with Pulsed Amperometric Detection (PAD). This analysis gives the quantity of the different monomers in the EPSs, and thus both the composition and quantity of EPS. The detection limit is lower than 0.1 μM for monosaccharides, which enables quantification of small amounts of EPSs. In order to verify that the hydrolysis yield and PAD quantification were linear, EPSs from S. thermophilus LY03 were purified by ethanol precipitation and extensive dialysis. Different dilutions of EPS from 1:1 to 1:20 were hydrolysed and analysed (Fig. 1). 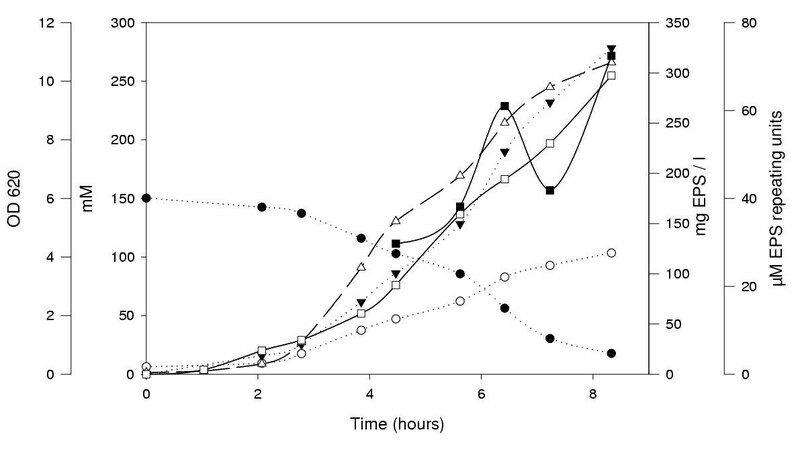 As can be seen from the results, the hydrolysis conditions influence the amount of monosaccharides released, but the release was linearly proportional to the amount of EPSs. Hardy et al  reported that strong acid hydrolysis was needed for the total release of amino sugars which, however, also decreased the yields of galactose and glucose. We hydrolysed purified EPS from S. thermophilus LY03 in 4 M HCl or 2 M trifluoracetic acid (TFA) for different times, and found that 45 minutes in 4 M HCl gave the optimal release of galacatosamine, galactose and glucose in desirable proportions (data not shown). After prolonged hydrolysis the levels of galactose and glucose decreased. As the hydrolysis time is critical, more reliable results could be achieved by quantifying the amino sugars after hydrolysis in HCl and the other sugars after hydrolysis in TFA . Linearity of hydrolysis yields. Purified EPSs were diluted and hydrolysed in 4 M HCl (filled circles) or 2 M TFA (open circles). To ascertain whether MST could also be used for other strains of S. thermophilus, we grew six strains in tube cultures and analysed the EPSs produced using the new protocol (Table 2). Under these conditions all strains grew well, with maximum specific growth rates from 0.44 to 0.96 h-1. EPSs from three of the strains have previously been characterised using NMR , and the monomer compositions of the isolated EPSs after hydrolysis with HCl could be compared with these results. The composition of the EPSs isolated from S. thermophilus LY03 fitted well with the expected repeating unit of 2 galactoses, 1 glucose and 1 N-actetylgalactosamine, the later being deacetylated to galactosamine during hydrolysis. For S. thermophilus SY89 and SY102, EPSs with repeating units consisting of 2 galactose and 2 glucose molecules have previously been identified . With the new isolation and analysis method, these two sugars were clearly seen to dominate, but small amounts of galactosamine were also detected. In the NMR experiments only the soluble EPSs were isolated. A possible explanation of the divergent results could be the presence of insoluble polysaccharides which can be recovered with our isolation method, but not with methods involving precipitation and solution of EPS. The new protocol measures total EPS, and the monosaccharide analysis will thus be influenced by all isolated EPSs. To distinguish between EPSs of different size, a size-exclusion purification step could be included after the ultracentrifugation. However, the initial screening with the protocol should be followed up by NMR and or other methods for exact structural and compositional determination. Monomer concentrations after hydrolysis in 4 M HCl. EPSs were analysed at the optical density (OD) indicated. Abbreviations: μmax, maximum specific growth rate; Glc, glucose; Gal, galactose; GalN, galactosamine. No rhamnose or glucosamine was found in the EPSs from any of the strains. *Composition of soluble EPS as determined by NMR . The galactosamine is actually N-acetylgalactosamine, but the acetyl group is removed during hydrolysis. The medium was also evaluated in anaerobic cultivations in a fermentor with pH control. When LY03 was grown under these conditions, a maximum specific growth rate of about 1.5 h-1 was observed, which is at least as high as that previously observed in an optimised MRS broth . The lactose consumption, as well as formation of galatose and lactate, could also be followed by HPLC (Fig. 2). To investigate the production of EPSs during cultivation, both the purification method employing TCA and acetone precipitation of De Vuyst et al  and the protocol described in this article were used. As can be seen in Fig. 2, the new method allowed quantification of EPSs early in the cultures, and the EPS production could be followed throughout the cultivation. With the other method, 30 ml samples were analysed, but the results were still more variable than with the new method. The standard deviation for the method of De Vuyst et al has been reported to be 20%  and this may be partly attributed to the fact that the polysaccharide pellets are easily lost during purification. The amount of EPS produced by S. thermophilus LY03 in MST medium, as determined by weight, was higher than 0.3 g/l after about 8 hours. Values of over 1 g/l have previously been reported in optimised MRS medium with 75 g lactose/I for this strain, using the same quantification method . However, it is not clear how much of the dry polymer mass was derived from components in the yeast extract and peptones in the MRS broth. Cultivation of S. thermophilus LY03 in MST medium with pH control. Filled circles, lactose (mM); open circles, galactose (mM); filled triangles, lactate (mM); open triangles, optical density (OD620); filled squares, EPS (mg/1) quantified after precipitation by mass; open squares, EPS (μM repeating units) quantified from galactosamine peak after hydrolysis. The molar mass of the repeating unit is 762 g according to the NMR structure . Another promising approach for the quantification of EPS has been described by Looijesteijn and Hugenholtz . EPSs are separated from monosaccharides in culture supernatants by gel permeation chromatography and are quantified by refractive index detection. However, the high detection limit of refractive index detection makes this method suitable only for quantification of EPSs from strains producing high levels of EPSs. Quantification by PAD may provide some improvement. Unfortunately, we found that the response factor for EPSs of PAD using a quadruple waveform for carbohydrate detection was very low before hydrolysis (data not shown). Therefore, hydrolysis of the EPSs will probably be necessary before this detection method can be used for quantification. The MST medium described in this paper should be useful for physiological studies of S. thermophilus. In combination with the purification and analysis method for EPS it can be used for small-scale experiments, and will be useful for screening strains of S. thermophilus for EPSs. The S. thermophilus strains used in this study were obtained from the University of Huddersfield, except for DSM 8713, which was obtained from the German Collection of Microorganisms and Cell Cultures (DSMZ), and LY03 which was obtained from Vrije Universiteit Brussel, Belgium. The strains were routinely cultured at 42°C in Ml 7 (Oxoid) and stored at -80°C. For studies in MST medium (Table 1, for protocol see Additional file: MST.rtf)), an overnight culture in MST was used as inoculum (2% vol/vol). Tube cultures were performed in glass tubes with an initial volume of 10 ml, and growth was monitored in a tube spectrophotometer by measuring the optical density at 620 nm. pH-controlled batch cultivation was performed in a Biostat fermentor (B. Braun). The pH was adjusted to 6.2 by automatic addition of 10 N NaOH, and the stirring speed was set to 100 rpm. Anaerobic conditions were obtained by nitrogen flushing in the head space. Lactose, galactose and lactate were analysed by HPLC as described previously . Cell growth was monitored by measuring the optical density (OD) at 620 nm. Samples with an OD greater than 0.4 were diluted. For isolation of EPSs, culture samples were centrifuged at 14,000 × g for 5 minutes to remove the cells. To the supernatant, 1/3 volume of 40% TCA was added in order to inactivate EPS-degrading enzymes and to precipitate proteins. The samples were then stored at 4°C until analysis. The samples were centrifuged for 10 minutes at 20,000 × g, 4°C. Supernatant, 0.5 ml, was added to a microcon M-30 ultracentrifugation filter (Millipore) and centrifuged at 14,000 × g for 20 min. The washing was repeated twice, and finally 0.5 ml water was added and the retentate was eluted upside down at 1000 × g for 3 minutes. For quantification and monomer analysis of the EPSs, 0.25 ml of 8 M HCl or 41 μl TFA was added to 0.25 ml of purified sample. The EPSs were hydrolysed at 100°C for 45 minutes in HCl or for 3 h in TFA. The samples were dried in a Speedvac AES2000 (Savant) at low temperature, dissolved in 1 ml of water, and analysed with HPAEC with PAD. The injection volume was 25 μl and the samples were separated on a Carbopac PA1 column (Dionex, Sunnyvale, CA, USA) with a pre-column in 16 mM NaOH at 1 ml/min. Post-column 300 mM NaOH at 0.5 ml/min was added for optimal detection. The standards contained 1, 5 and 10 μM each of rhamnose, galactosamine, glucosamine, galactose and glucose. This work was supported by the European Community FAIR programme, contract no CT-98-4267.